In November 2017 at Anime NYC, Kodansha Comics made an appearance at a Sailor Moon panel to make a special announcement. To celebrate the 25th anniversary of Sailor Moon, a special Eternal Edition of the manga would be coming out in the West. Sailor Moon Eternal Edition will be a new translation of the popular manga series and be collected in ten volumes. The first volume of the Eternal Edition was released in September 2018. It contains acts 1 through to 7 of the manga and retails for $49.99 in Australia. It is a little under 300 pages long and suitable for people 13 years and older. I've been a Sailor Moon fan ever since I was twelve years old. I first read the manga when I was in high school and I have collected it several times over already, so when the Eternal Edition was announced, I wasn't immediately sure if I wanted to invest in another version of the manga. I ended up getting the first volume of the Eternal Edition as a present for Christmas and was very impressed by it. I don't know where I'm going to find the space on my bookshelf but…I'm going to get all of them. Again. Sailor Moon Eternal Edition is twice as big as the original manga and made with very high quality, glossy paper. 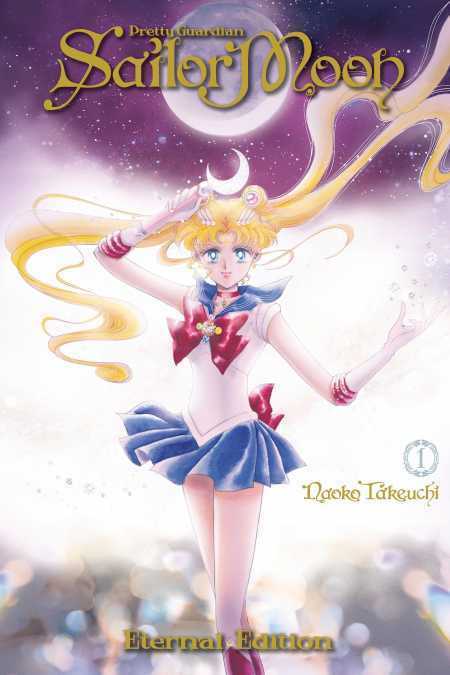 The front cover has a new image of Sailor Moon on it, holding her moon wand and has a glittery shine to it. The pages in the book are of a premium thickness and the ink does not smudge. The book contains mostly black and white illustrations, with a few full-colour pages sprinkled throughout. This version of the manga has a new and updated English translation. A few things jumped out to me like Usagi wasn't called Bunny (an English version of her name that has been used before), and the Moon Stick was called the Moon Wand. There is a section at the end of the book that explains what some of the things mentioned in the book are. The first few acts of the Sailor Moon manga are some of my favourites. I love the sexual tension that exists between Usagi and Mamoru (Tuxedo Mask) in the manga. In the anime, the two of them argue a lot and Usagi is very childish. There is still something between them but in the manga – woo boy! The spark between them is a lot more intense. My favourite scene in volume one is when Usagi wakes up in Mamoru's house after fainting and spots his tuxedo hat, mask and cape draped casually over a couch and then Mamoru comes into the room partially undressed. It's a lot of fun watching their relationship develop in the manga. If you grew up watching the Sailor Moon anime but haven't had a chance to read the manga yet, then the Eternal Editions will be a great place to start. Why? Fans of Sailor Moon will want to pick up the Eternal Edition of the Sailor Moon manga which is extra-long, twice as big, and features a ton of new additions.